CHANNEL DELAYS: LDLines Poole-Santander cancelled, and return on 2 January, due to ‘extreme weather’ in Bay of Biscay. WEATHER ALERT: Amber alert heavy rain Ireland, flooding France, coastal event Spain, avalanche Slovenia, fog Montenegro. WEATHER: Windy and wet in northern Europe, areas of rain to the far south. ROADS: Recent heavy snow across high ground, Alps and Massif Central. Some minor roads still closed south Switzerland but in general the roads are clear – next bust day expected to be Saturday. TRAFFIC: Paris still busy but no delays over 20mins. A55 southbound into Marseille lane closed delay 35mins. Earlier queues Austria, Innsbruck-bound A13 Brennerbahn and inbound A2 at Klagenfurt, both gone. Otherwise, road network is as quiet as it has been all day. Note: road works both ways on the D1075 which runs parallel to the A48 through west Grenoble. 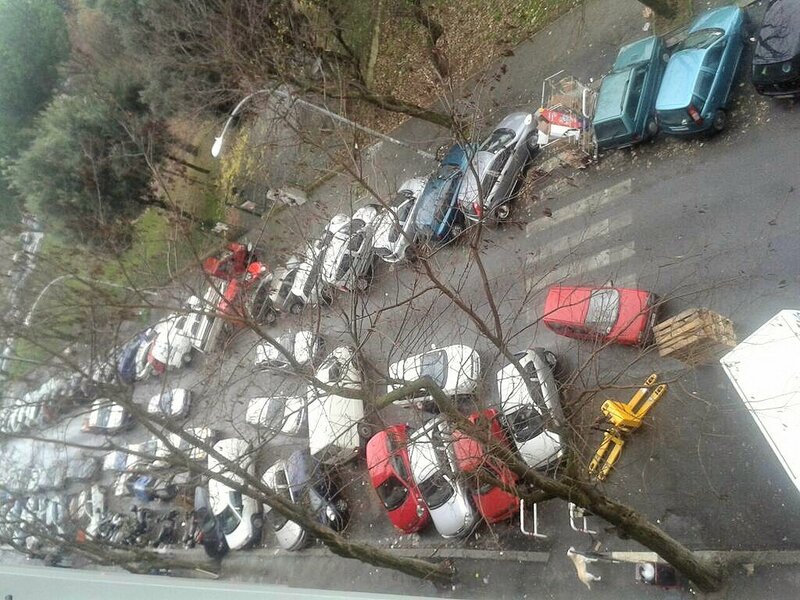 The famously haphazard parking in Rome is set to become a thing of the past after the local police force set up a Twitter account for users to report traffic offences. Unlike a similar scheme in Bucharest which is meant to educate drivers, Rome police will prosecute based on evidence submitted via Twitter. The first social fines have been issued already. This is the best pic we found so far, see @PLRomaCapitale for more.